For the first time in more than two decades, a majority of voters express dissatisfaction with their choices for president this fall: Just 40% say they are very or fairly satisfied, while 58% say they are not too or not at all satisfied. By comparison, the balance of opinion at this point four years ago was roughly the reverse: 56% were satisfied with their choices, while 41% were not. Satisfaction with the choices was even higher in June of the 2000, 2004 and 2008 elections, with six-in-ten or more voters then saying they were satisfied with their choices for president. Today, Republican and Democratic voters express similarly low levels of satisfaction with the field of candidates: 40% of Republicans and Republican leaners, and 43% of Democrats and Democratic leaners, say they are very or fairly satisfied with the selections. In 2008 and 2012, Democrats registered higher levels of satisfaction than Republicans, while Republicans were more satisfied with the field than Democrats in 2004. Though those in most age groups are less satisfied with the candidates this year than they have been in the last few elections, this is particularly the case among younger voters. Just 23% of voters under 30 now say they are very or fairly satisfied with the field, down from 60% in 2012, and nearly seven-in-ten (68%) in 2008. Voters 50 and older now express greater satisfaction than younger voters: 48% are satisfied with their choices today. In 2012, older and younger voters were about equally likely to express satisfaction with the candidates (56% of those 50 and older vs. 60% of those under 30). The lower levels of satisfaction among younger voters today are evident within both parties: Just 29% of Republicans and Republican leaners under 35 say they are satisfied with the candidates, compared with 51% of GOP voters 65 and older. The pattern is nearly identical among Democrats: 54% of older voters are satisfied with their choices, compared with just 26% of Democratic voters under 35. In another indicator of dissatisfaction with the field of candidates, asked if it is difficult to choose between Hillary Clinton and Donald Trump because “either one would make a good president,” just 11% express agreement, a smaller share than at any point in the last 16 years. At the same time, the percentage agreeing with a similar statement that it is a difficult choice because “neither one would make a good president” (41%) is as high as at any point over this period. The feeling that neither candidate would make a good president is more pronounced among Republicans than Democrats: 46% of Republicans and Republican leaners agree that it is difficult to choose between Clinton and Trump because neither would make a good president; 33% of Democratic voters say the same. Republican views that neither presidential candidate would make a good president are higher than in any election over the last sixteen years. Among Democratic voters, more now say neither candidate would make a good president than did so in 2008 or 2012, but as many expressed this view in the 2000 and 2004 elections. Will the parties unite behind Clinton and Trump? 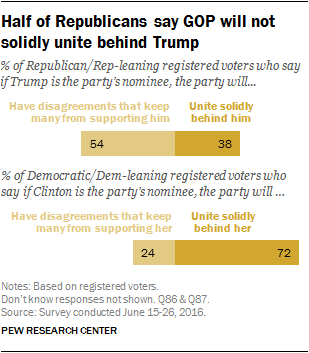 Republicans remain skeptical that their party will unite behind Trump: About four-in-ten (38%) think that their party will unite behind their nominee, while 54% say internal disagreements in the GOP will keep many from supporting him. These views are relatively unchanged since March, and far fewer say the party will unite behind Trump than said this of either John McCain in 2008 or Mitt Romney in 2012. Democrats express much more confidence that their party will unite behind Clinton: 72% say this, while just 24% say disagreements within the party will keep many from supporting her. The share saying the party will solidly unite behind Clinton has grown over the last few months, from 64% in March to 72% today. In both parties, voters who supported candidates that did not become the party’s nominee are less sure that the party will unite. 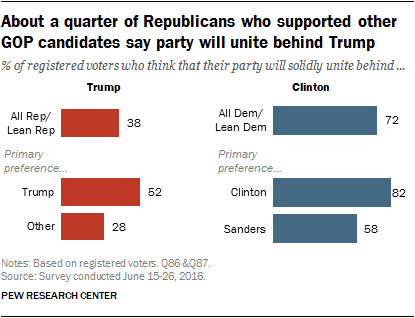 Still, while 58% of Sanders supporters think that the party will unite behind Clinton (compared with 82% of Clinton’s backers), just 28% of voters who supported candidates other than Trump believe that the party will unite behind him (compared with 52% of his primary supporters).